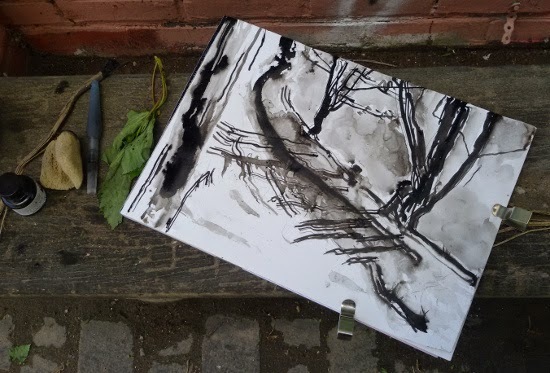 Today I fancied responding to the towpath by drawing with found objects picked up near where I was working. I find it tempting when working on a drawing to try and control every mark that I make on the paper. This is actually impossible to achieve so I can end up feeling quite exhausted. Since I'm aiming to challenge myself with these drawings I decided today was the day to let go of my usual expectations and try and relax. Surprise, surprise it worked and I completely lost any sense of time. 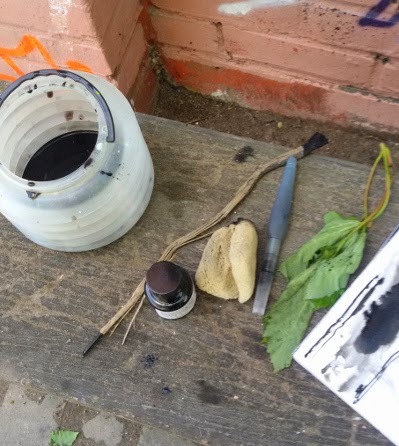 What you can't see from the photograph is all the dust and gritty stuff that is trapped in the ink. I think it adds an interesting dimension to the finished piece along with all the little drops of water that found their way on to the page. I found a bench that was secluded from the wind but I was still subjected to a constant shower of dust. In the end I just stopped blowing it off and let it be. Thanks Margot, glad you like it.